A celebratory bottle of Brut Royal NV embodies the elegant Pommery style – a lively, fresh champagne with a nose of citrus and small berries. From The Wolseley Collection, a medium-bodied claret from this iconic estate in the northern Médoc region, offers notes of classic blackcurrant, a fine overlay of well-balanced vanilla oak and silky polished tannins. To complete the set, a beautifully fine and crisp white wine also from The Wolseley Collection, with aromas of white flowers and citrus fruits from one of the oldest wine-growing families in Sancerre. Each bottle is presented in its own unique gift box. 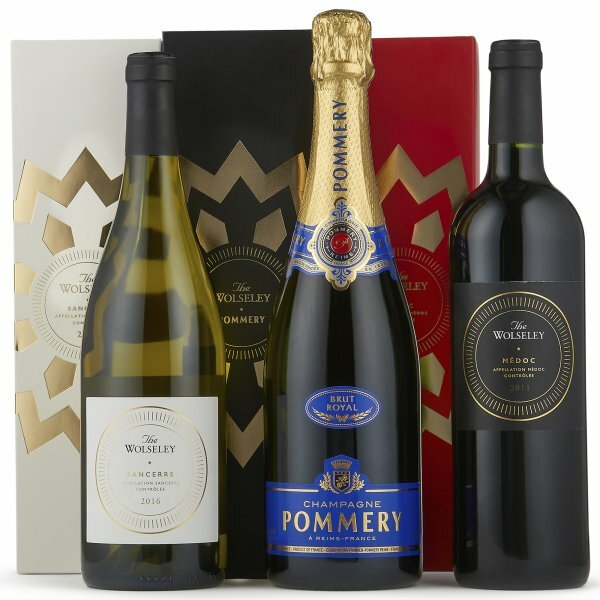 Gift set contains: Pommery Brut Royal NV (75cl), Château La Tour de By, Médoc 2011 (75cl) and Domaine André Dezat & Fils, Sancerre 2016 (75cl).